Part of the Belle Tiffany lighting range. Lovely modern take on a traditional floral Tiffany design, with a neutral cream background and vibrant floral leaded glass design. 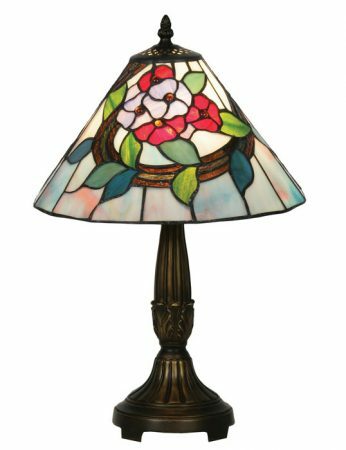 A medium 300mm (12 inch) diameter Tiffany table lamp with poppy red and pastel flowers surrounded by olive green leaves and amber rippled glass ribbons that will sparkle when illuminated. A wonderful medium sized Tiffany table lamp with a detailed antique brass finish base that will add a splash of vibrant colour in any room.